Single room with loft and ladder. 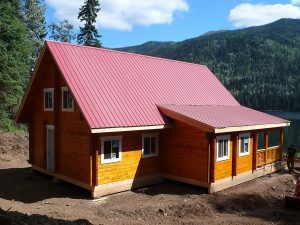 Log frame: : Consisting of 3”x 6” tongue & grove logs (t&g) with saddle notch connections, ridge beam, loft with timber joists, 2x6 t&g floor boards and ladder, timber truss with posts and jacks and special log screws to secure logs. Doors and windows (recreational, without building permit): Steel insulated man door for the entrance door and vinyl sliding windows with mosquito screen. Door and windows come with outside and inside trim and miscellaneous screws and nails.